Dangerdog Music Reviews and founder and publisher Craig Hartranft are pleased to announce the 2018 Album Of The Year. 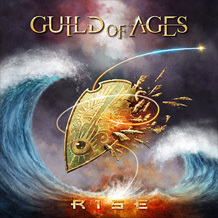 The annual honor goes to American band Guild Of Ages and their album Rise. Released at the end of June by England’s Escape Music, the album received a 5/5, the highest score possible for any review. Read more new music reviews at DangerdogMusicReviews.com.